Arctic Adventure is a 2D platformer that has Nevada Smith from Pharaoh's Tomb (1990)* make his return in this adventurous sequel. Our hero has gotten great praise for his finds in Egypt and now a month later we see that our hero is after something new, a great Viking boat that is full of great Viking treasure. Our hero studies for even more months and just happens to find a clue in an old skull. The clue was for that of a map that can lead him to that treasure but sadly he needs to find more of the map. Long story short, our hero must go to the Arctic and explore the caves in hopes of finding pieces of a map that will lead him to the Viking gold. (Click on "Read More" to read the full review). The story in this game goes for a fun adventure type of vibe similar to that found in the Indiana Jones series of films, it is also a very simple story but it is fun and is enough to draw you into the game. Do not expect much story progression, this game mainly focuses on the gameplay but you will get some story at the end of each episode. Yes, this is the gold edition of the game and has all four episodes (the core game plus the three expansion packs) and that's a great thing as not everyone were able to play the full game back in the day, it was a tougher task to get complete editions of these back day (I know I wasn't able to play the full versions of these games back in the day). Gameplay is very simple, all you do is walk and jump to collect treasure and get to the exit. However, while simple, it is quite challenging as there are some tough obstacles getting in your way such as spikes, hidden arrows that launch at you, boulders, and falling rocks. 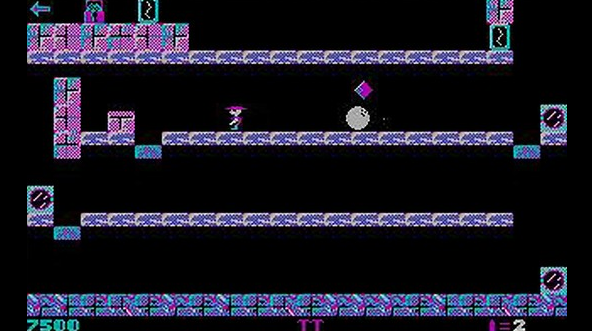 It's not just stuff like that getting in your way, some levels are a puzzle in themselves and you'll have to collect certain items like keys and equipment to not only progress though the level, they are also used to progress though the game in general and some of those items will have to be used wisely. This game also starts you on an over world to where you can choose the level you want to play, some of these levels will be blocked off by locked doors and water, that's why you need certain items to get though the game. This game will take you awhile to beat due to the challenging levels but it was incredibly fun to play though this game as the gameplay hooks you right in despite using a very old and outdated system. You won't only be playing though this game one time, you'll also be replaying this game more than you'd think due to the replay value being quite high. If you don't want to beat this game in one sitting, you don't have to as there is a simple save system that's easy to use. The controls in this game are very simple and are very functional, so you won't have any trouble moving around. My problem with this game is that you can get stuck in certain parts of the levels, so you will have to restart the stage all over and that's when the game isn't fun. Another big problem is that there are game breaking glitches in the expansion packs that will freeze the game and you won't be able to restart the level by the typical means, so you'll have to leave the game and boot it back up again. Graphics in this game are really primitive, lacking in details, and have barely any color but it has its charm, especially if you grew up with these old games and/or if you love retro games. The animation is better than you'd expect for an old game like this but even so, it is alright. This game doesn't have any music but is does have some sound effects but I didn't like them due to sounding very sharp, especially for the sound of arrows being fired at you and it did hurt my ears. You won't be bothered by the primitive graphics and sound due to the gameplay holding up really well and will draw your attention away from that. Overall, this game might look terribly aged and obsolete but it is actually quite enjoyable and fun. Sadly, the Steam release is no longer up but lucky for you, the game is freeware and can be obtained directly from 3D Realms as a legal download. So what are you waiting for? It is a good game. *Note: Yeah, it is kind of weird how I'm reviewing Arctic Adventure and Pharaoh's Tomb in reverse order but who cares.